I just received a nice Radeon HD 6970 from SAPPHIRE (the review is coming) which gave me the opportunity to update a bit GPU Caps Viewer and GPU Shark. 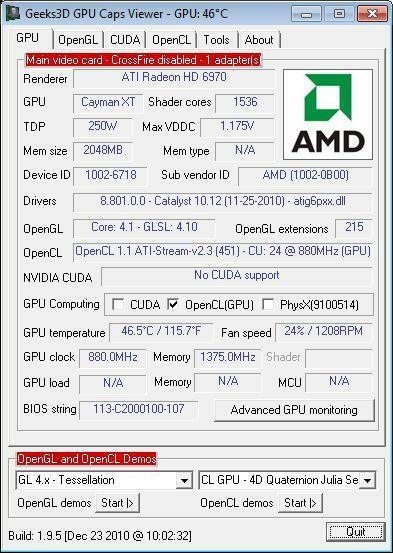 GPU Caps Viewer 1.9.5 comes with the support of AMD Radeon HD 6970 and Radeon HD 6950. I also fixed a small bug in the reading of Radeon memory size. New: added support of AMD Radeon HD 6970 and HD 6950. Bugfix: in memory size for Radeon cards. man save screenshot as png. it hurts my eyes when i see that jpg compression artifacts.